Although Adobe once released their own Photoshop Touch app for iPhone and iPad, they dropped the project and those apps were gone long ago. That is a really once-upon-a-time story. I am sure all iOS users had been longing for a Photoshop-like app for iPhone and iPad badly since then. Our wishes finally came true by Serif Labs introducing Affinity Photo during WWDC 2017 back in May. 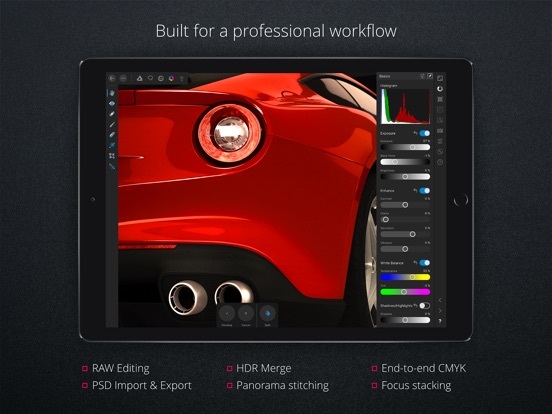 It has every tool you need for photograph editing, and support for Apple Pencil. It can also open .psd files! Put your PSD files on iCloud Drive you will see them on iPad too. Affinity Photo is the 2017 iPad App of the Year because: It brings pro-grade photo-editing tools to the touchscreen. 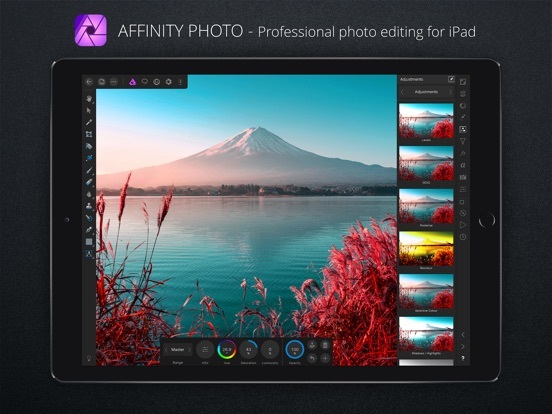 Launched for iPad this year, Affinity Photo is a pro-grade photo editor and illustration tool that's wowed professional users and enthusiastic amateurs alike. 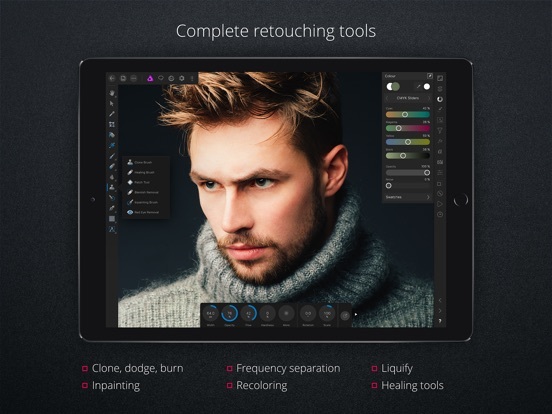 Comprehensive and uncompromising, this studio-quality app offers hundreds of retouching tools, filter effects, brushes, and layering options. 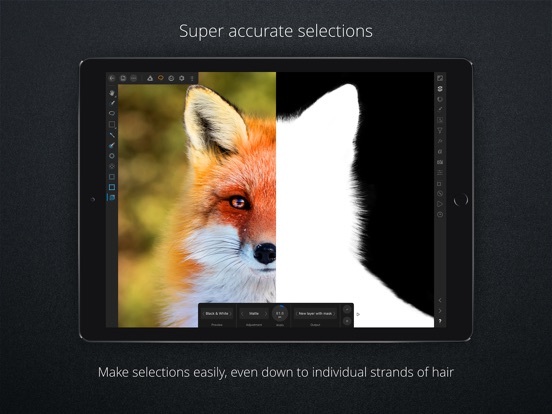 Its image-selection tool is capable of picking out individual hairs, and the lighting tools let you add realistic digital light sources to images. Most important, you can view these highly complex edits in real time, without having to wait for them to render. Drag your filters or effects over your image and immediately see the results, whether applying a mesh warp to melt physical objects or immersing yourself in a 360-degree photo and making alterations as you go. Edits are nondestructive which means the quality of your base image is never compromised. 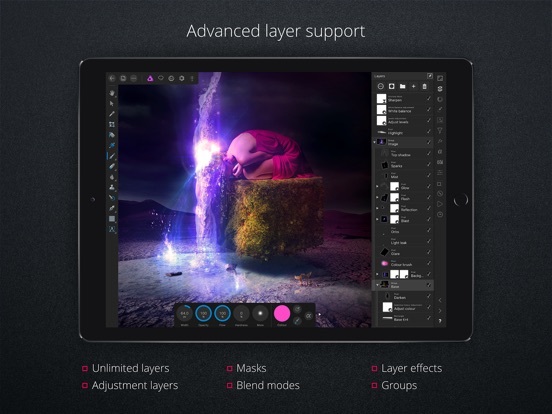 Although Affinity Photo has been available on the App Store on Mac since 2015, it wasn't until this past May that the developer, Serif, brought the app to iPad. The new touch screen version, incidentally, is just as powerful as the desktop counterpart, offering iPad users tools previously found only in expensive software that practically required a master's degree to use. Make real-world objects look like toys with Affinity Photo's powerful Tilt-Shift tool. explains Ashley Hewson, Serif's managing director. Affinity Photo, in other words, is no jack-of-all-trades: it's a master of all.